The Resolutions were adopted after the Board reviewed the provisions of the “General Regulations for the Establishment and Operation of Holy Monasteries in the Greek Orthodox Archdiocese of America” [Protocol #95] issued by the Ecumenical Patriarchate on February 16, 2005. The Regulations are set forth in the Official Documents of the Archdiocese on the website of the Archdiocese (goarch.org). Article 14 requires the permission of the local Metropolitan for the construction of buildings. OCL will hold its 30th Annual Conference in Chicago, October 27-29, 2017. For more information contact, George E. Matsoukas, Executive Director at (561) 585-0245 or gmatsoukas@ocl.org. Are there “regulations” in other countries regarding the operation of the monasteries? Is there a problem with our monasteries? 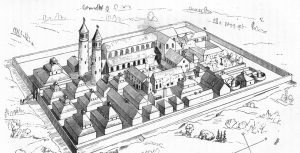 Prior to the “Latinization” of the Celtic church many lay communities formed around the monasteries. The monastery was the parish. Celtic spirituality of that time mirrored the East. Unlike the early Celtic church, the communities near and around these monasteries are not “lay” communities, they are “church” communities. The laity attend these church communities and uses their facilities and clergy to baptize their children, to marry, and to bury their loved ones. It’s been reported that some monastic communities are usurping the role and responsibility of the local parish church and luring the laity for such sacraments as baptism and marriage. And in some instances the monks and nuns of these institution have a cult-like stranglehold on some of the more vulnerable faithful. Generally, this has been unprecedented in this country. I wrote in another area (Tradition Without Fundamentalism) concerning the deleterious effects that the “Ephraimite” style of Monasteries are having upon the cross-jurisdictional parish communities in the United States. Here I would like to speak to one item in particular, the Aerial Toll House heresy, that the Ephraimite Monasteries are actively promoting. They even just published a 1000 page book teaching this heresy. In a nutshell, the false teaching alleges that upon death, the soul undergoes a journey through a number of “Toll Houses” where the demons of Hell examine particular sins of the person at each toll house. If the person can successfully give an account , then he/she can pass through and go to the next Toll House. If a person can pass through each Toll House, THEN they can proceed to Paradise. Ephraimites teach that “Blind obedience” to your priest, abbot, spiritual father, will give you a free pass through these Toll-houses. One can easily imagine how that could be exploited by self-aggrandizing ilks of base character. This falsehood, indeed this heresy, this lie, completely insults Christ’s sacrifice on the Cross for us. This falsehood, this heresy, this lie, puts the demons as our judge, and not the Lord. This falsehood, this heresy, this lie, dismisses the incredible phenomenon known as “grace”. Each liturgy we pray for a good account before the awesome judgment seat of Christ – not the demons. Christ is our judge. And when we all face Him (indeed an intense event) our only defense, our only hope, is being released on a technicality – for what excuse can we give for sinning? Adam tried blaming Eve as his excuse. Didn’t work for him. It won’t work for us. Our only hope then is the technicality known as Divine Grace, through which (as scripture clearly states) we are saved. Indeed, as Orthodox Christians, this should not be news to us. There is no teaching of Aerial Toll Houses in Scripture, in Canons, in the Funeral Service, etcetera. 1. Distorting Scripture to suggest that this teaching is there. In some sense, they use this as a type of secret knowledge of what awaits us. This is a modern-day form of the Gnostic heresy. I could go on. But let me only highlight on last item. The Monastery in Florence, AZ just published a book that is over 1000 pages long, alleging that Aerial Toll Houses are true and part of Orthodox beliefs. I don’t think doctoral dissertations are that long. To make matters worse, there are Orthodox Hierarchs that have foolishly given their endorsement of the book – as printed therein. This does not represent the dogma of the Orthodox Christian Church. Let me predict something: The Protestant Church leadership (or some other Christian denomination) will get a hold of that book, and there will begin a campaign alleging that Orthodox Christians believe salvation is in the hands of demons. If you think people have left our Church now – “you aint seen nuthin’ yet!” There will be a profound exodus of people that is beyond what is already happening. Even those who think that this is merely a metaphor, or “theologoumenon” should re-evaluate and not give such credit to this profound insult and distortion. This heresy should not be given a foolish “de facto” endorsement either. The Dumbarton Oaks Papers are held in very high esteem amongst scholarly circles. While profane people like me point to simple and obvious truths, this scholarly approach by Dr. Nicholas Constas (now known as the Priest-Monk Maximos from Mount Athos) examines every minutia of detail and presents his conclusion that this is a false teaching. I honor and respect the Parish Community as a place and source of holiness. I also honor and respect the same in unadulterated and healthy Monasticism (as is the case with the deeply respected Priest-Monk Maximos, and others). That is why I will speak out on anything that is of concern. I believe it is my responsibility as a human to speak the truth. Otherwise I would feel guilty of passively allowing a falsehood to continue. Please join me in addressing this. Do not be afraid to speak the Truth, even when it is uncomfortable. I read somewhere that: “Truth plus one person equals the majority”. That may take time, but that is the side I choose to be on. Ultimately the masses will discover that. The Lord knows. May He send us the Grace we need to overcome this evil challenge as we have historically overcome other ones. I believe the Lord does that through people like you and me.